Everything your lawn care business needs in a website! LandCareSites is easy to use and will have you set up with a website in minutes. 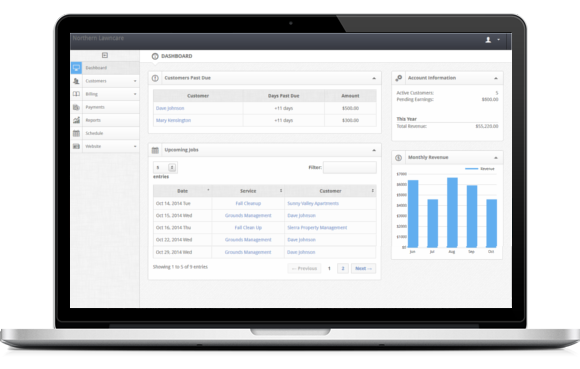 Schedule invoices to be sent to customers automatically, accept online payments and easily track who owes you money. Every user account includes a free professionaly designed, customizable, mobile friendly website that will look great on almost any device. Keep track of all of your client information, such as payment history, contact information, service scheduling and more. Quickly generate financial and other reports with just a few clicks. Collect credit card payments from customers online. No need to run to the bank to cash checks. Create and quickly re-schedule jobs with our drag and drop scheduling calendar. Our mission is simple, to provide easy to use, website and business management solutions for lawn care and landscaping businesses.